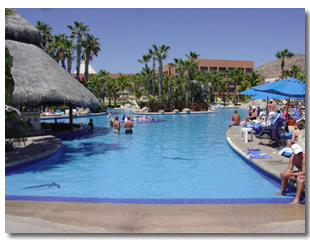 The Melia Cabo Real Beach and Golf resort is a Cabo San Lucas resort that's fairly well priced. It's not as expensive as some of the top resorts in Cabo considering it's on a swimmable beach. You can't swim in the sea or ocean at many beaches in Cabo San Lucas so it's a rare luxury. This is another Cabo resort we couldn't afford to stay in so we spoke to some of the guests staying there. We got mixed reviews from the people staying so it is advised to read some reviews of your own. Some people loved this golf resort, and some just didn't get on with it at all. The food was one item that has a massive difference of approval. Some of the guests really enjoyed the food. They rotate the menu every day to add some variety, but they said if you want gourmet food then the Melia isn't for you. This goes for nearly every Cabo San Lucas resort that's all inclusive. The guests that expected, or wanted the gourmet menu were very disappointed with the food. It seems when someone gets one disappointment about something this then leads into them totally disliking everything about the Melia Cabo Real. If you do plan eating at the Japanese restaurant is advised to make your reservation early as a few people said it gets booked quite quickly. The beach at the Melia Cabo Real is a swimmable beach. Cabo San Lucas is surrounded by The Sea Of Cortez and the Pacific Ocean so safe places to swim are few and far between. The good thing about the Melia beach is it doesn't have the crowds of El Medano beach, and it doesn't have the vendors either. You do however get the odd person walking along the beach selling small gifts. If you want a spot at the pool you need to save your place by about 7.00 am. Anywhere near 9.00 am is too late. The pool area is massive, and there were plenty of children enjoying themselves in the pool. You have the Cabo Real golf course next to this Cabo San Lucas resort, and guests get a 10% discount on the greens there. You are given transport there as well. There are also 5 other championship golf courses along the Los Cabos Corridor. So if you do like your golf you will be kept busy during your vacation. Most people seemed happy with the staff, especially the activities staff. The management was the part of the staff that most people didn't get on with. As I said at the start the guests were mixed with their reviews so it is best to look at some more reviews for this Cabo San Lucas resort. 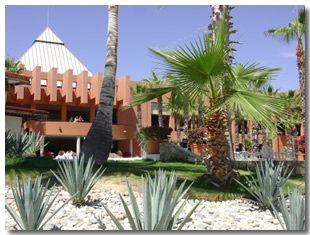 On paper the Melia Cabo Real all inclusive Beach and Golf resort looks a lovely place to stay.